Ace Cash Express has deployed two lobbyists to the state Capitol and has given about $35,000 in campaign contributions in support of legislation to create a new type of loan, with a 204 percent annual interest rate. Gov. Mary Fallin vetoed the bill. Story updated May 5, 2017. Gov. Mary Fallin vetoed a bill on Friday that would have created a loan with a 204 percent annual interest rate. In her veto message, Fallin wrote that the bill, which reflects a national push from the payday lending industry for similar legislation, would create a high-interest product without restricting access to other payday loan products. “In fact, I believe that some of the loans created by this bill would be MORE EXPENSIVE than the current loan options,” she wrote. 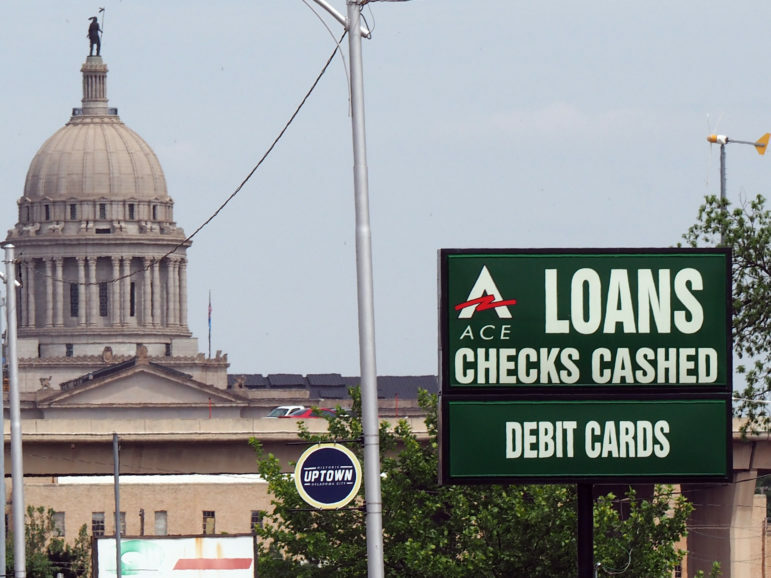 Oklahoma’s legislation had one of the highest potential annual interest rates among 10 similar payday lending bills this year in seven states, an Oklahoma Watch review found. House Bill 1913 would have created “small” loans with a monthly interest rate of 17 percent, which equates to 204 percent annual interest rate. A 12-month loan of $1,500 would leave borrowers owing about $2,100 in total interest if all payments were made on time. Asked for comment about the bill, the office of one of its sponsors, Rep. Chris Kannady, R-Oklahoma City, referred all questions to a senior vice president at a large payday lending company, Advance America. The company is part of Mexico-based Grupo Elektra, which is the largest payday lending firm in the United States and is owned by Mexican billionaire Ricardo Salinas. Jamie Fulmer, of Advance America, said he didn’t know who wrote Oklahoma’s bill. HB 1913 would not have required lenders to check a borrower’s ability to pay and would have given the lender direct access to customers’ bank accounts. Fallin vetoed legislation four years ago that would have created a short-term loan with an annual interest rate of 141 percent. Supporters of the bill said it would increase borrowing options for people who have poor credit records and can’t obtain lower-interest loans. Opponents said the loans would be predatory because the interest rates are high and could bury vulnerable borrowers in debt. A spokeswoman for the bill’s other sponsor, Sen. James Leewright, R-Bristow, said he was also unavailable to answer questions. In a written statement, Leewright said the bill offered higher-risk borrowers “a much better product” and improves their options. The bill proposed a type of loan that is different than traditional payday loans. Payday lending involves loans of up to $500 that borrowers are expected to pay back in a lump sum within 12 to 45 days. The proposed new small loans could be up to $1,500 and borrowers would pay them back monthly for up to 12 months. Payday loans have higher rates that are currently capped at 456 percent in annual interest. The new small loans are capped at an interest rate of 17 percent a month, or 204 percent annually. Policy experts said the payday lending industry crafted the new legislation. Ezekiel Gorrocino, a policy associate for the Center for Responsible Lending, a North Carolina-based nonprofit that fights predatory lending practices, described the legislation as a “prepackaged” bill that payday lending companies have pushed over the past few years across the country. Gorrocino said the industry advocated for the same legislation in about a dozen states this year, but most of the bills didn’t survive. Similar legislation appeared in Arizona, Indiana, Iowa, Kentucky, Maine and Nebraska. The bills identified in other states would also establish new high-interest loans – a “flexible loan” in Iowa, a “fair credit loan” in Kentucky, a “small loan” in Maine and a “Consumer Access Line of Credit Loan” in Arizona. The loans typically are in the $500 to $2,500 range and have terms of no more than two years. Various fees could add hundreds of dollars to borrowers’ costs. Some lawmakers expressed concerns during Senate debate that HB 1913 had been pushed by out-of-state lending interests who sent lobbyists to the Capitol. Oklahoma Watch also identified bills introduced last year in Oklahoma, Alabama, Kentucky and Nebraska, most of which contained language almost identical to HB 1913. Of the four bills, Oklahoma’s contained the highest annual interest rate. Last year’s bill would have created a new type of product called flex loans. Those would have carried an interest rate of 20 percent per month, or 240 percent annual interest. Holt said that members of the payday lending industry had approached him about writing the bill to avoid pending federal regulations. Payday and installment loan companies and their political action committees, associations and employees have spent at least $68,600 in campaign donations since last year, Oklahoma Ethics Commission records show. Five lobbyists with ties to the industry spent more – almost $100,000 in campaign contributions to Oklahoma politicians. Advance America and its PAC donated $22,800 to lawmakers and two other PACs – Majority Fund and Oklahomans for a Strong Future. Flash Cash Loans and Community Loans of Edmond offer payday loans in Edmond. 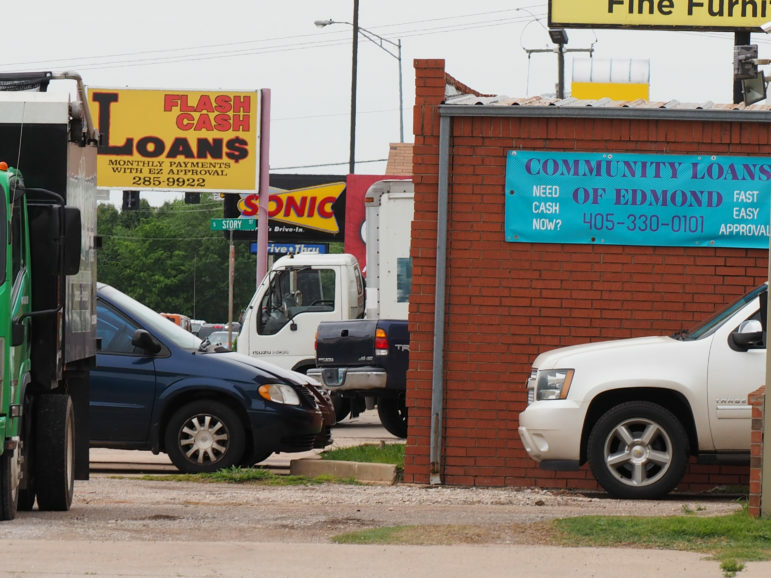 The payday loan industry has influenced legislation that would create a new type of high-interest loan in Oklahoma. The bill awaits action from Gov. Mary Fallin. Lending companies and related associations retained at least seven lobbyists to approach legislators and state consumer credit and banking agencies this session. Those lobbyists have spent about $96,960 in campaign contributions since last year. The most was spent by lobbyist Jami Longacre, who gave $54,750 in campaign donations. Longacre represents Multistate Associates Inc. and affiliated payday loan company Check Into Cash. “I have noticed a big flood of out-of-state activity at the Capitol in terms of lobbyists pushing very hard for this bill to further out-of-state chains that will be benefiting from this practice,” said Sen. Joe Newhouse, R-Broken Arrow, who opposed the bill. During debate on April 27, several senators expressed concern that the federal Consumer Financial Protection Bureau is seeking to eliminate payday loans altogether. Sen. Dan Newberry, R-Tulsa, suggested the bureau wants to shut down about 3,500 payday loan locations across the state, putting thousands of people out of work. HB 1913 would bring another option to the marketplace, he said. “Let’s not demagogue what this is on some high morality ground,” he said. Newberry sponsored the 2013 bill that Fallin vetoed and since last year has received $13,500 in campaign donations from PACs and individuals with ties to payday lenders, records show. Concerns over possible federal regulation are behind efforts in a number of states to pass this legislation, Gorrocino said. Last year, the bureau issued a preliminary ruling that lenders must ensure their customers have the ability to repay a loan without defaulting or taking out additional loans. “The fact that lenders are saying this principle of responsible lending – making sure they can pay it back – will put them out of business is evidence they rely on trapping consumers in unaffordable debt in order to survive,” Gorrocino said. When asked if he sees any issues with the interest rate, Fulmer, of Advance America, said the new type of loans would increase options for borrowers and empower consumers. “So, really you have to understand when you evaluate the cost, it’s easy to say something’s too expensive, but when you put it in the context of the real world and the consequences of not getting credit, it’s a different discussion, and it’s a more realistic discussion,” Fulmer said. Jonathan Small,president of the Oklahoma Council of Public Affairs, said the loans would help consumers and called criticism of the interest rate a scare tactic. Newhouse, who voted against the bill, said there are already sources for short-term loans with lower interest rates.